What a soggy month it was although it went out with a bang with two of the hottest days of the year. No two days are ever the same. 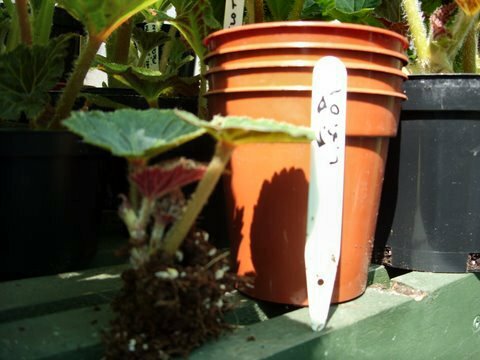 Definitely a case of using the fan to keep the temperature down a bit in the greenhouse for the first time. Other than that it has been grey with downpours and deluges on a frequent basis. 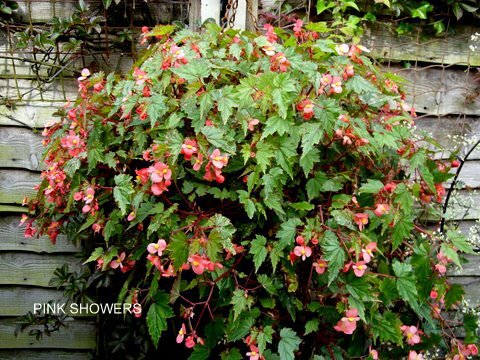 This has given rise to rampant mildew infections that come almost overnight. My fears of the water butts running dry now I am on a meter were well and truly allayed, for this year at least. The greenhouse is jogging along very nicely overall. 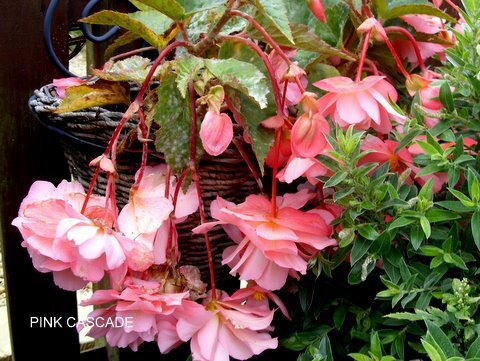 A case of the good, the bad and the ugly as far as the begonias are concerned. I aim to flower by August and then continue in stages for the rest of the season. Not a lot is happening and all they require is watering, feeding and a bit of TLC. Nothing really to report on the greenhouse front but outside the baskets etc are coming on to flower. 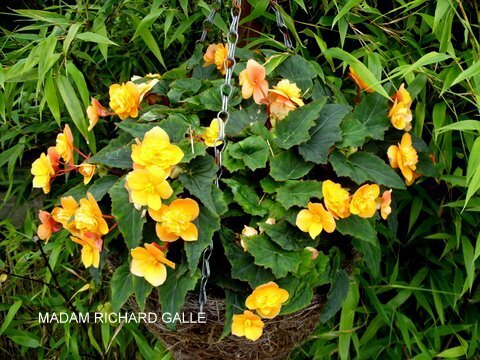 To illustrate there is more to begonias than the double tuberous variety I took the camera out and about in the garden on the first of the month. Here is a snapshot of what I am growing outside. By the time you read this, probably six weeks will have elapsed since I took the pictures, so I can give you an update of how they are going and my ratings out of ten. The compost used in the containers was Godwins, a local Somerset Levels firm of many years standing. This is the first time I have used this product and was a bit apprehensive as it seemed to have a large sedge peat content, beside sphagnum, Perlite and additives. However, overall it has performed really quite well. From July I feed weekly with a general purpose fertiliser, Wilkinson Wonder Gro, to give continued growth after the initial additives have been exhausted. The containers were treated with Provado to eliminate Vine Weevil at the end of June and will get a further dose in early September. 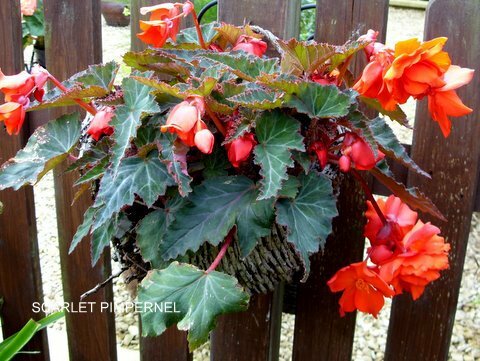 The average score is 8.5 which considering there are a number of begonias that I rate highly, such as Fire Dance, Flamboyant, Champagne and Dainty Dancer, have not been included. I have cut out all bedding plants and use begonias to bring colour and highlights to areas of the garden. By using a number of easy moveable containers, such as half baskets and pedestals, you can interchange as suits and remove baskets that are not performing or are past their best for whatever reason. Funny old month. It blew hot and cold in a month of contrasts. The start of the month was very hot, fresh and windy and it finished hot, humid and airless. 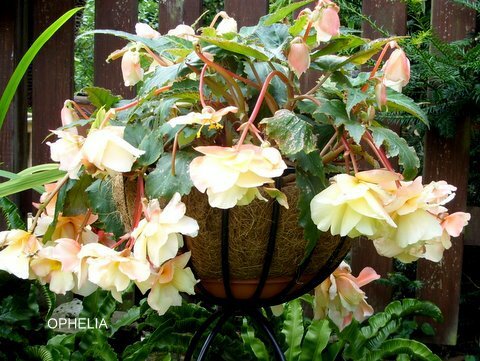 I know what I prefer and so do the begonias! Overall it made a pleasant change to get some sun at long last. A very busy time with the better weather and a much improved back, has given the opportunity to catch up. (A) First of the month. So much to do. What to do first? Couldn’t resist the temptation to see how the cuttings taken on 1st May have got on. Well pleased. This is a Fire Dance, normally a difficult one to take. The root systems on all the other cuttings are similar which gives confidence of some good sized tubers. The downside is that I lost about 25% of my basal cuttings which is rather unusual. 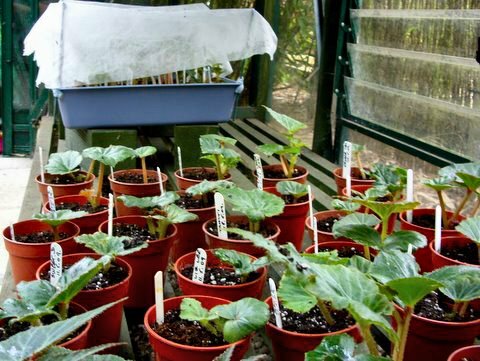 The cuttings are now potted on to 3½" pots, using multi purpose compost and placed under the staging for a few weeks until space is available in the lean to at the back of the main greenhouse. 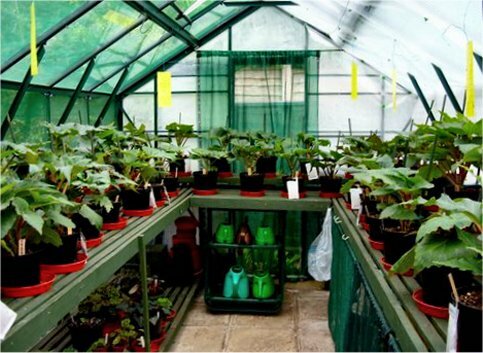 (B) The main objective now is to make space in the greenhouse. Half baskets are planted up and I plan to move on gradually over the next couple of weeks to the troughs and tubs. 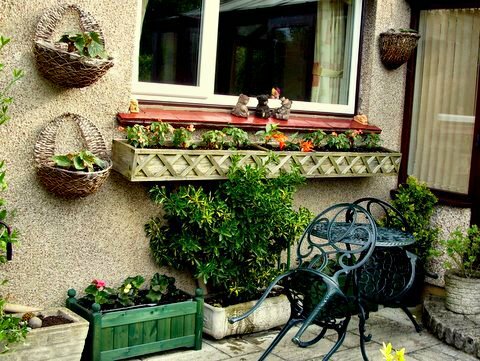 Eight hanging baskets have been planted, four less than last year. 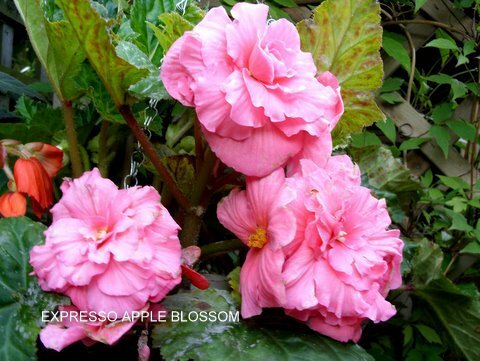 The varieties are Sutherlandii, Fire Dance, Flamboyant, Champagne, Espresso Apple Blossom, Roy Mackey, Pin-up Flame and some Antonelli seedlings. Particularly interested in how the later turn out as they had a very rough journey to get to me. It was a wonder that any survived. 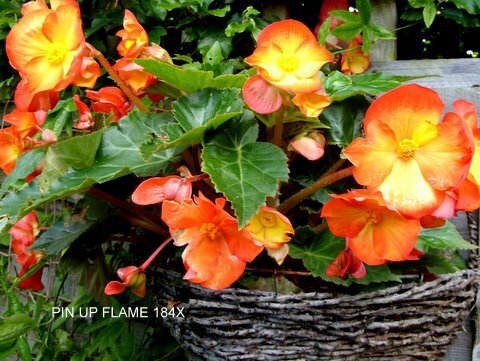 The baskets are then hung throughout the garden so take their chance with all that Mother Nature throws at them. 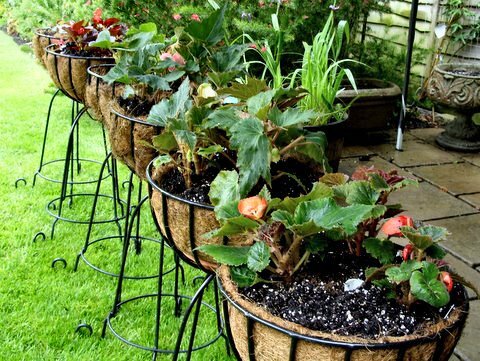 (C) I have six pedestal baskets that I find are excellent as you can move them around the garden to suit conditions and brighten up any dull areas in the garden that may occur. Again, I use multi purpose compost with a plastic pipe in the centre to allow water to penetrate to the bottom of the baskets. Also, below the liner I place a pot saucer filled with hydroponic clay pebbles that helps retain the moisture after watering. 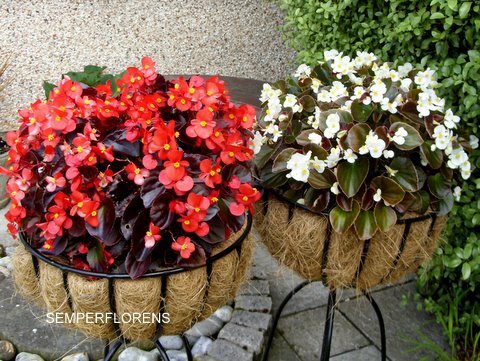 Varieties are, Isabella, Lou-Ann, Ophelia, Odorata and two baskets semperfloren as a change. (D) Now to the back of the house, which is the focal point of the garden display. Here it is in its infancy. 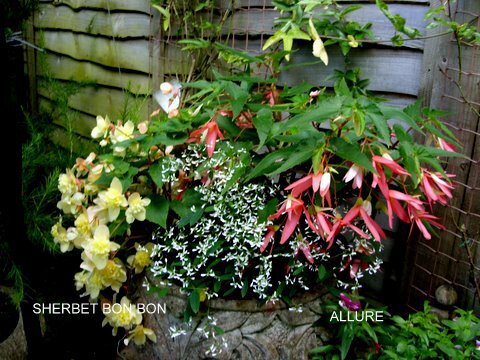 The three half baskets are Fire Dance (first year cutting tubers), the window trough consists of Dainty Dancer and Boliviensis Firestorm and the ground troughs will contain a mixed selection of Solenia. Some of these varieties are new to me. (E) The second week of June saw the Rose and Sweet Pea Show, organised jointly by Nailsea and Highbridge Horticultural Societies at the Garden World venue just down the M.5 at Highbridge. 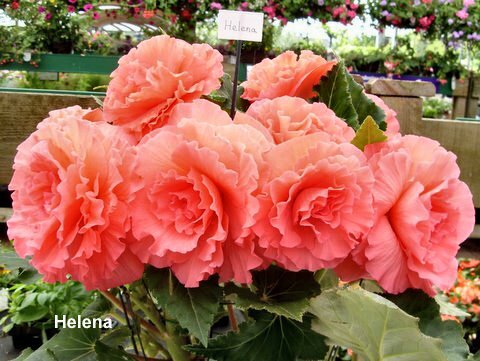 I knew Lakin Earl was putting in a begonia, Helena, and I went down on Sunday to have a look. What a worthwhile journey. The tuber, started off in Lakin’s airing cupboard in mid January was magnificent for such an early bloom. It took all the attention from the roses and sweet peas and it was no surprise that it won best exhibit in show. Additionally, Lakin’s Little Brother Montgomery was best foliage plant and he was even more pleased when his cauliflower was judged best vegetable. 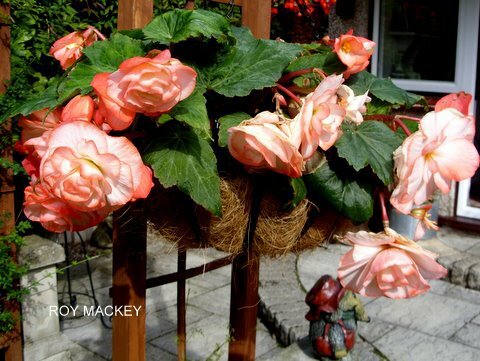 It gives encouragement to us lesser mortals for the main begonia season to come. Well done. Lakin. (F) My style of growing is single stem, leaving one or at most two side shoots, providing they are towards the top of the stem. This allows me to grow more plants than multi stem. 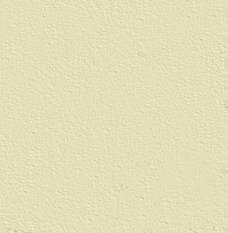 This is Westlawn Tango and you will note that the second batch of Amblyseius has been introduced. The method I use is what I call the “Brian Simmons method”. This is placing the pots in saucers and watering from the bottom. It may be not for the purists but it keeps it simple and Brian hasn’t done so badly over the years. You know that the plants get the water they require and what’s more they are easier to move around. I am aware of a number of other growers that now use this method. At the end of the day, it is what suits you and your facilities. 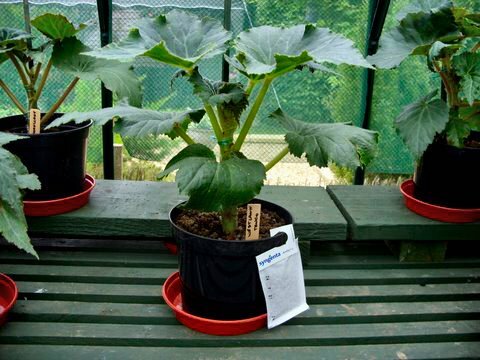 I grow in 2 and 3 litre pots and for the first time 4 litre for the largest of tubers. Last year I used traditional Sankey pots but found they toppled over due to the smaller pot base than the normal black pots. I have reverted back this year. (G) The cutting tubers are coming along “very nicely”. I have now taken two trays of stem cutting, so there must be a further seventy or so cuttings in the pipe line. These are in the cat litter trays, again using coir as the medium, covered with fleece, shown towards the rear. 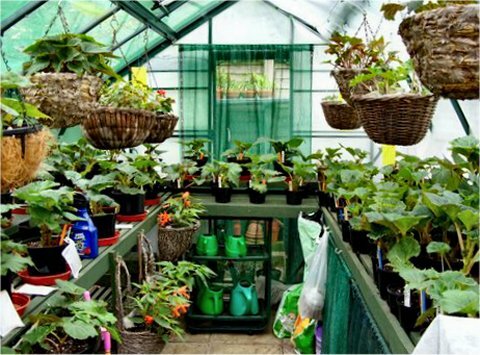 The propagator has been dispensed with as no heat is required from say, mid June. I must be very selective from now on otherwise I will be overrun again. I usually, and possibly this is tempting fate, have better success with stem than basal cuttings. (H) The final weekend of the month saw a mass redistribution of plants. Fourteen have gone down the road to No. 25. A further dozen to friends around Nailsea in the hope that they will join the NBS and the balance of some twenty to Tony Willoughby. This has reduced the number from over 100 to a manageable 42, with a few spares round the back. This will no doubt be reduced further depending on the success or otherwise. It has been a very hectic and at the same time satisfying month. 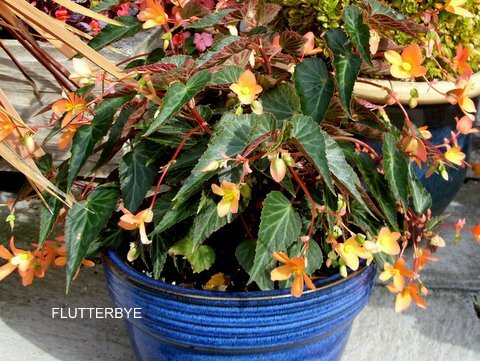 Things generally look good and all the plants require is some TLC. Bit concerned about the four Fred Martins, one of my favourites, that I am growing. Three seem to have grown blind and one purported to be FM, looks more like a Fire Dance, grown on a single stem. Be interesting to see what it turns out to be. 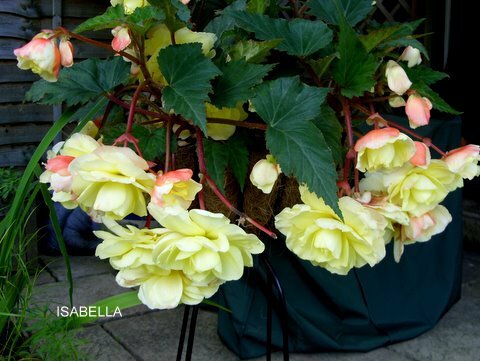 Finally all begonias both inside and outside, including the new cutting tubers, have been treated with Provado Vine Weevil Killer² and the outside plants will get another dose towards the end of August.